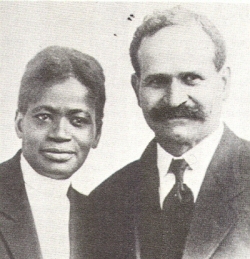 For nearly thirty years, Emma Ray, who was born into slavery and raised in poverty in Missouri, ministered to the poor and homeless in Seattle slums along with her husband, L.P. They came to Seattle following the 1889 fire in order for L.P. to find work as a stonemason. Shortly after, they were converted in the African Methodist Episcopal Church. Emma helped to found the Frances Harper Colored Unit of the Women’s Christian Temperance Union with fifteen women from the AME Church, and she served as its president. With her WCTU Unit, Emma visited the jail, holding religious services on Sunday afternoons. On Wednesday afternoons, she and “Mother” Ryther, who ran an orphanage in Seattle, visited prostitutes and held services in the brothels. Between 1900 and 1902, Emma and L.P. ran a mission in Kansas City, Missouri, for children living in poverty, providing clothes, meals, a warm place to gather in the winter, trips to the park in the summer, and weekly Sunday School. The Rays eventually joined The Free Methodist Church and were licensed as Conference Evangelists. Under the auspices of the Free Methodists, they preached revival meetings in churches throughout the state of Washington. Emma’s autobiography, Twice Sold, Twice Ransomed, was published by the Free Methodist Publishing House in 1926. Emma Ray, Twice Sold, Twice Ransomed (Seattle: Free Methodist Publishing House, 1926).